This book is difficult to assign a genre to, I’ve plonked it under sci-fi but it’s not a comfortable fit. It’s a time travel romance where the heroine is thrown back to caveman days (yes, that is a technical term!) where she then meets Ehd. 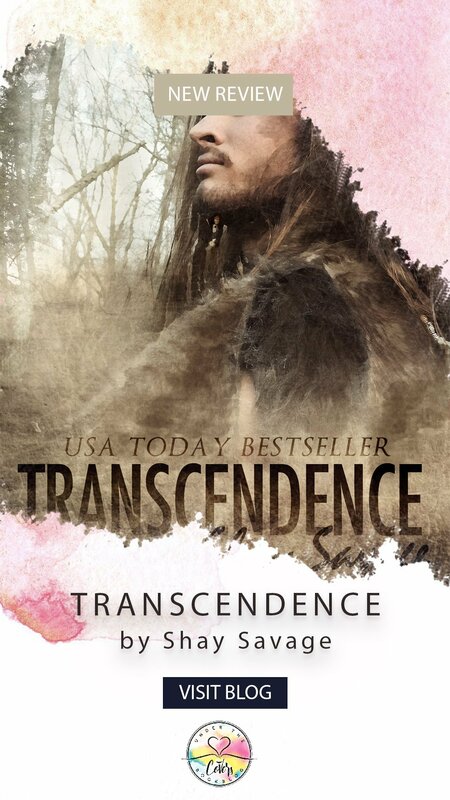 Transcendence follows the journey of Ehd and Elizabeth’s relationship as they survive in a primitive environment and overcome more internal obstacles such as their inability to communicate with each other in a traditional way. I loved this book. It was a unique and beautiful romance that had me in tears by the end. They weren’t even sad tears…they were just pure emotion. Unique is probably a descriptor you’ll see a lot when you read reviews of this book. Savage chose to tell this tale entirely from the POV of Ehd, I kept expecting a chapter, maybe even an epilogue, from Elizabeth’s POV but it never happens. I loved this decision. We can deduct through our own insight the thoughts and feelings of Elizabeth, however, due to their lack or communication – which I will come to next! – we wouldn’t be able to do the same for Ehd. I think this book wouldn’t have been anywhere near as powerful if we hadn’t seen the story unfold through Ehd’s eyes. Now on to the second point of why this book is unique. Their lack of communication. There are a few books I’ve read where there is a verbal communication barrier in place. However, eventually this is lifted. In Transcendence this never happens. Ehd is completely unable to understand language. His brain doesn’t have the ability to process and translate sound into meaning the way we can. This means they must find other ways of trying to “speak”, in this book action literally speaks louder than words. There is point in this book where Elizabeth is given the opportunity to go home. Ehd doesn’t know this, but as the reader we do. We also understand that Elizabeth chooses to stay with Ehd. For me this moment was so powerful, made even more so by the fact that Ehd never realises. This really is a beautifully crafted book. I had no idea when I opened it up that I was going to be starting my favourite book of 2019 so far. I recommend to everyone who loves romance, no matter the genre, Ehd and Elizabeth are sure to wiggle their way into your heart. I loved this book, I’ve read the ebook and listened to the audiobook. I still need to read Luffs: Transcendence Novella. I was thinking about getting Luffs as well…but I haven’t heard great things about it and I don’t want it to spoil how much I loved Transcendence! But I know I will end up picking it eventually, anything for a little more Ehd! I’ve heard so many great things about this book! Okay. I give in. I’m getting it now. Thanks for the review! This really does sound unique. I’ll have to check this out. And there it sets unread on my shelf…. you make me regret my laziness. This sounds brilliant.